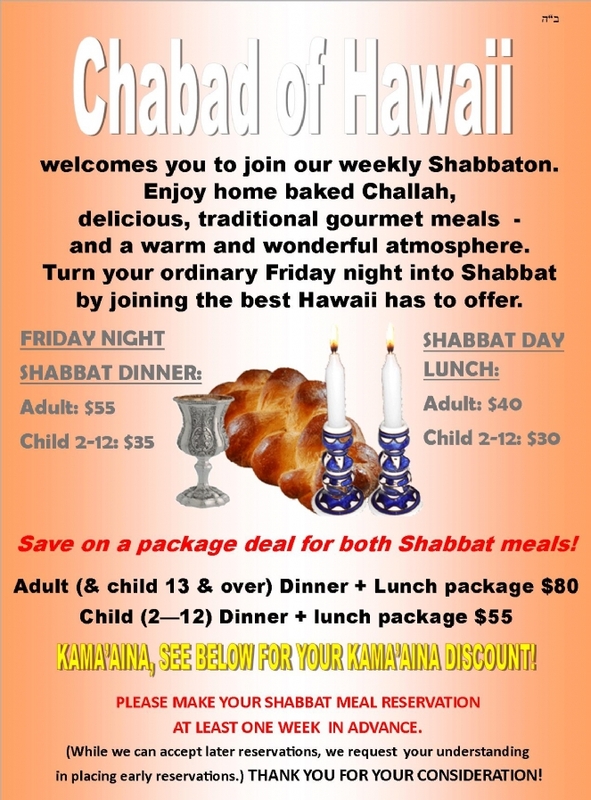 For Shabbat reservations, please specify which dates your reservation is for in the Comments box below. If you are reserving for more than one week, please indicate that as well. Thank you. SHABBAT BEFORE PESACH, APRIL 12 & 13, THERE WILL BE SERVICES & TEFILLOT. HOWEVER, NO COMMUNAL SHABBAT MEALS AT CHABAD HOUSE. PLEASE DO NOT RESERVE FOR THAT SHABBAT. All * fields below are required. (Reservations cannot be processed if all * fields are not filled in correctly). Thank You. E-mail* Thank you for your reservation! We look forward to greeting you! Optional Additional Donation Please consider a donation to help the wonderful work of Chabad in bringing Judaism to every corner of our remote island state! Heartfelt thanks and many blessings to you! Thank you for your reservation: We look forward to having you join us!